Misunderstandings related to hammertoes can cause people needless injury sometimes to the point of needing surgery or even amputation in the worst case scenarios. Continue reading to learn more about common hammertoe misunderstandings that could lead to unhealthy feet..
#1: Hammertoes always require surgery. Though surgery is a treatment option for hammertoes, it is not always the first suggestion a podiatrist may make. If a hammertoe is diagnosed early enough, then your podiatrist may suggest wearing specially-made prescription insoles called orthotics that fit larger into your shoes replacing the factory insole. Your podiatrist may also suggest stretches and/or exercises that focus on the muscles of the toes to relieve pain. If these methods do not work, or the condition has progressed too far, podiatric hammertoe surgery may be the best course of action. #2: Corns have nothing to do with hammertoes. Corns are typically a result of having developed a hammertoe. 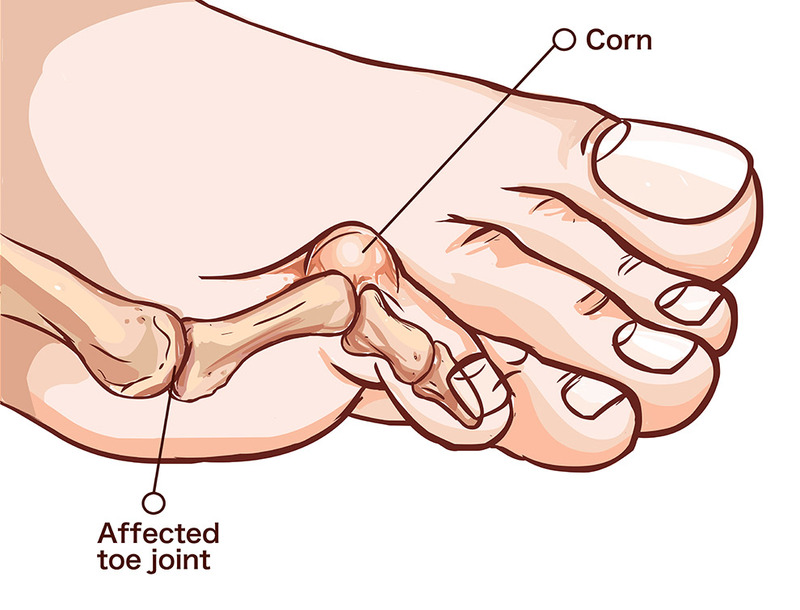 A corn is a collection of skin that develops on the knuckle or tip of a hammertoe from rubbing the inside of a shoe. Many patients try over-the-counter corn pads to remove the corn or may try to cut it off themselves. This is not advised because it can lead to infection or the need to amputate the toe in some diabetics or others with circulation issues. Consult with your podiatrist before administering any medication at home. #3: Hammertoes are only caused by arthritis. Arthritis is just one cause of hammertoes. Wearing too tight or narrow-toe high-heeled shoes can be a cause especially if you have long toes. As the toes crowd, the middle toes may curl downward, causing a hammertoe. The little “pinky” toe may receive a lot of pressure too and cause a corn with a hammertoe. Hereditary plays a role too. If one or more of your blood-relatives has hammertoes you may develop them as well because they do “run in the family”. Bunions are often seen with hammertoes. Bunions too may be caused by ill-fitting shoes and heredity. Don’t hurt yourself or your feet! Visit FAMILY FOOT CENTER in Whitestone, QUEENS, NY to have your hammertoes or any other foot problem professionally examined, evaluated and treated by our Board Certified Podiatrist.